The Model 3000-CP-011 is a high flow, large volume dual cylinder pump system, capable of operating in continuous flow or pressure modes at flow rates to 100ml/minute or pressure to 20,000 psi. Cylinders can also be operated independently in either flow or pressure modes. 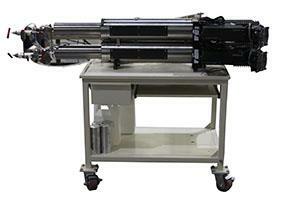 Designed for high temperature applications, the cylinders are mounted on a cart. The cart has locking castors, tool drawer, laptop computer shelf and a 1500 cc fluid reservoir capable of being re-pressurized to 125 psi. A laptop computer is included, with PumpWorks software pre-loaded and configured. The pump system uses 1/4 inch ported coned and threaded high flow valves with adaptors to standard 1/8 fittings supplied. This precision pump system is normally supplied with Chandler Engineering’s Model 3000 PVT System, but is ideal for use in additional applications where the need for precision delivery or pressure control of high flow/high pressure fluids is required. The system is based on our highly successful Quizix Pump Model 6000 Series Laboratory product line. It includes a Q6220 Dual Cylinder Pump. For additional details please see our Quizix Q6000 Metering Pumps page and our PumpWorks Software web page.